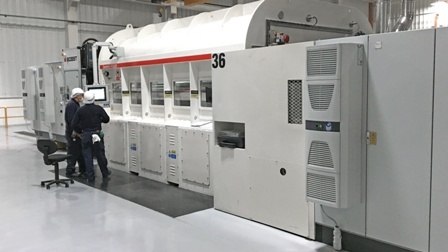 Biaxially oriented polypropylene (BOPP) films manufacturer Treofan has invested in Bobst metallizer, as part of its efforts to modernize its manufacturing operations. The company installed Bobst K5000 3650 mm wide metallizer to replace two old and inefficient metallizers at its facility in Mexico. Treofan installed 8.2m BOPP film line at Mexico facility in 2007, while new 8.7m BOPP film line at German plant in October 2015. Developed to produce wider metallized films, the K5000 will enable to run large diameters at high speeds. The machine will also allow to maintain temperature of the film, as well as protect the barrier. Treofan Americas chief operations officer Allan Crighton said: “The purchase of this new BOBST metallizer is in line with Treofan’s strategy to grow in the Americas. Treofan produces BOPP films for packaging, labels and tobacco industries, in addition to technical films for electronic applications. It manufactures packaging films for major brands in the consumer goods industry across the globe. The company’s transparent films can be used in various applications, including flowpack (HFFS), bag(VFFS), pre-made bag, pouch, overwrap, lamination, cold seal film, release film and ultra thin film. Treofan also produces solid white films for use in flowpack, bag, lamination and cold seal film applications. The company, which markets its products in around 90 countries, operates four production facilities in Germany, Italy and Mexico. Image: Treofan has installed Bobst K5000 vacuum metallizer at its production facility in Mexico. Photo: courtesy of BOBST.